Some time ago, Toni from Make It Perfect emailed me and asked if I would like to test her new pattern, Little Joey. 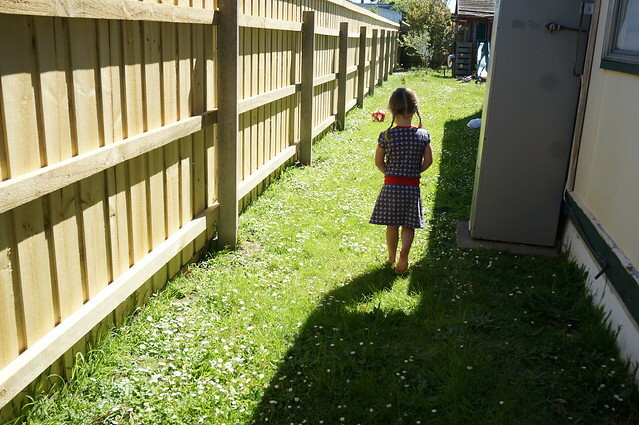 The dress looked so cute, I said "YES," and immediately ordered fabric from Crafty Mamas to put it together with. Crafty Mamas is my go-to shop for high quality stretch fabrics, and this Snow White themed apple fabric came in a Creative Pack with some coordinating dark grey and red fabric, some ribbon and a cute little bird iron on. I had my eye on that fabric pack already, and I knew that the Little Joey pattern was the perfect excuse for me to buy it. 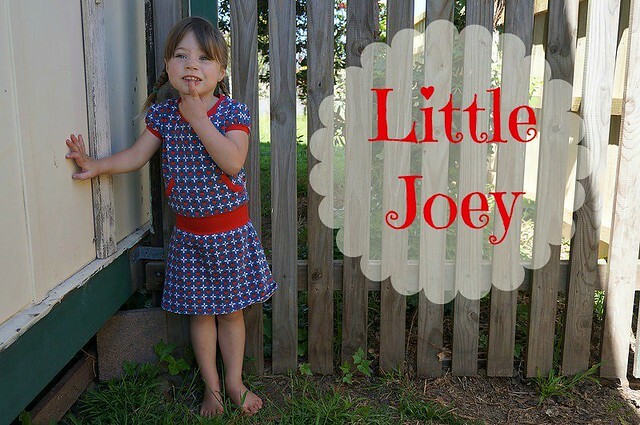 Little Joey is a cute little jersey dress with a waistband and kangaroo pockets. 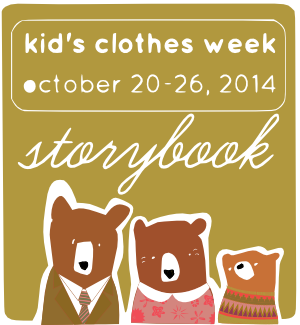 This particular pattern is for little girls from six months to five years. 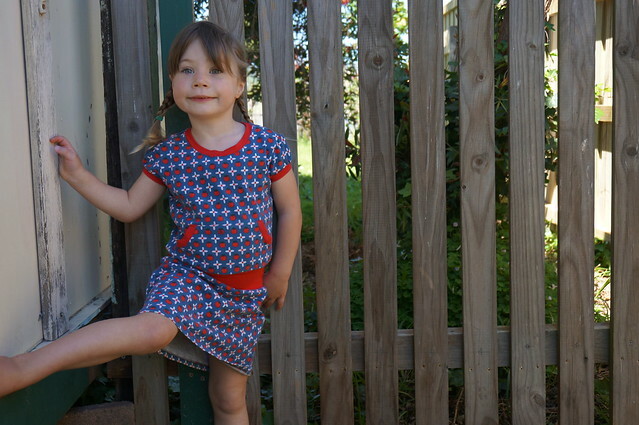 There is also a Big Joey pattern for your Little Joey's big sister, aged up to about 10, and a Skippy pattern, perfect for mums on the go. I made the size four pattern and chose to make it with the short sleeves. The fabric pack I had purchased only had 50cm of the apple fabric, and I was determined to make the pattern fit, despite the recommendation being for 110cm of main fabric. I think my piece was actually about 55cm or so, and I did make the skirt shorter to get it to fit. Something I did find odd about the pattern was that the bottom corners of the skirt come to a point, instead of being a neat curve. I trimmed these bits off before hemming. I did mention this to Toni in my pattern testing notes, but the final pattern was not changed. Whilst I would say that the fabric requirements are generous, I do recommend that you have a bit more than I did and it will be a less stressful exercise, especially if you wish to make a larger size, or long sleeves. 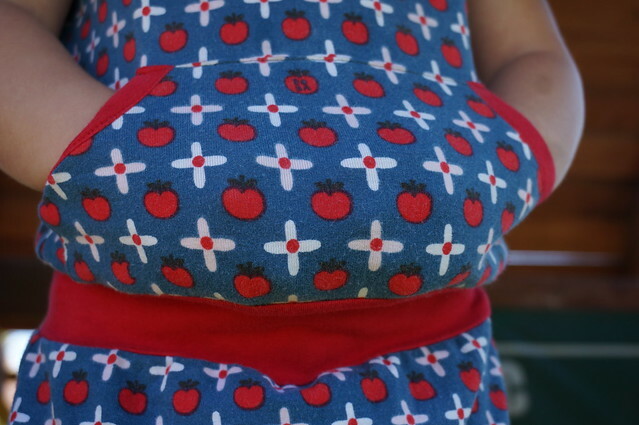 Alternately, I could have had a grey bodice and ironed on the bird, but I am glad I persevered with making the apple fabric fit. 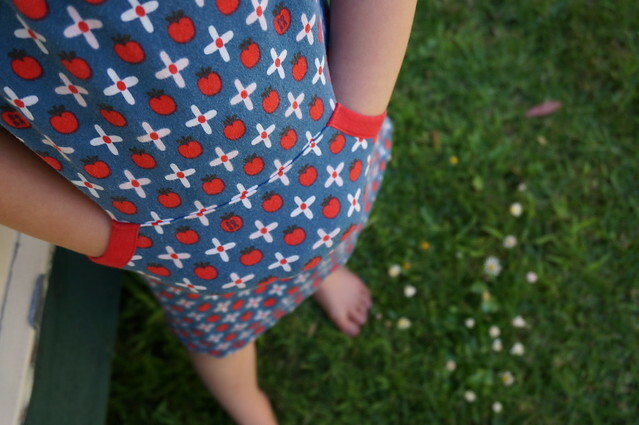 I used some of the red coordinating fabric from the Creative Pack for the neck and sleeve and waist bands. I think Amélie's favourite feature is the kangaroo pockets, where she can store matchbox cars and all sorts of other treasures. I just can't go past those cute little puffy sleeves. The sleeves were a little bit tricky because there were no notches to match between the sleeves and the armholes, so there was a bit of guesswork involved there. 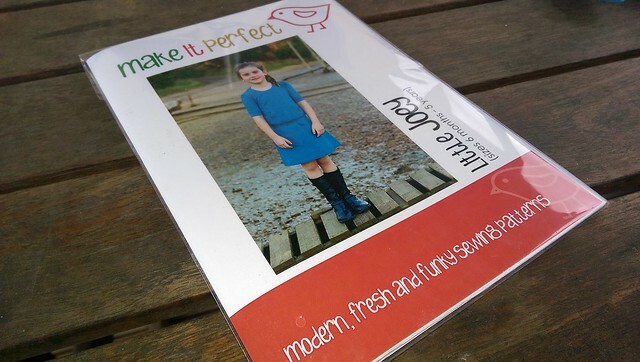 Whilst I still think the Make It Perfect patterns could use a little polish, the pattern was easy to put together and the end result is a cute little dress, perfect for playing in and easy to care for - no ironing!